Pin up Karen Lovegrove models a vintage fur stole for us. Her clever use of color and texture gives her vintage look contrast and depth. Photo by David Rowe Photography. It’s late autumn in the Northern Hemisphere – fur stole season. Time to wear your vintage fur stole, or, if it isn’t for you any more, time to sell it. I came back from a trip to an in box PACKED with fur stole queries. With this post, I’m doing my best to answer the most popular questions for the Internet. What is a fur stole? A fur stole is a large scarf, wrap, or capelet made of fur and lining, designed to be worn over your shoulders. 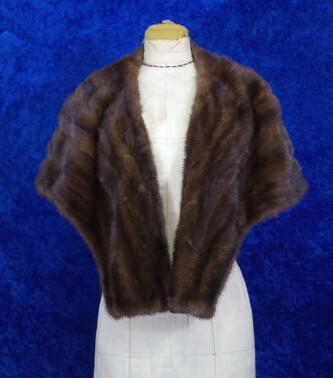 Most fur stoles from the 1920s through the 1970s have three layers: the exterior fur, an interior shaping layer made of felt, buckram, or horsehair fabric, and a satiny lining that was worn next to the skin. These different layers and types of fabric make it challenging to dye a fur stole and get good results. Fur garments, especially accessibly priced stoles, were very popular in Western culture from mid-Victorian times through the late 1960s. 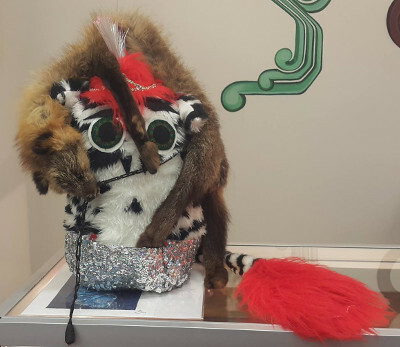 Then, styles and ethics changed drastically (this article on the history of fur is excellent) and the fur piece was no longer the equivalent of an It bag or iPhone. Because of their long association with value and luxury, we still associate high value with furs – even when most people are now carrying technology in their pockets that costs more than most vintage furs. 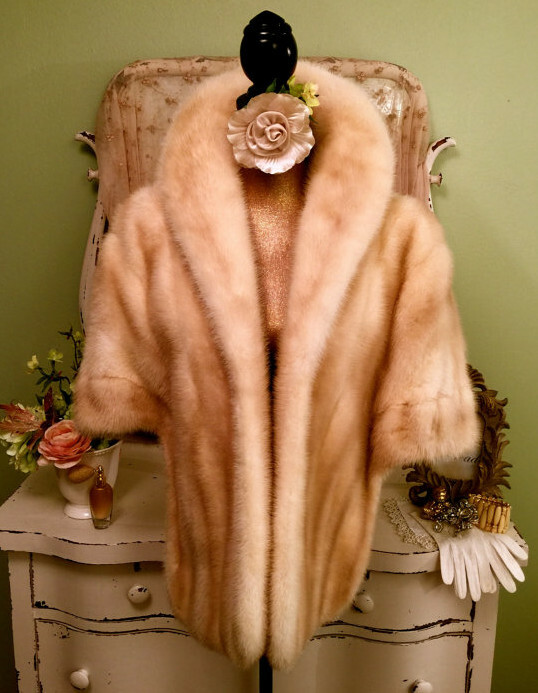 How do I choose a vintage or faux fur stole to wear? Simple guideline: wear one that contrasts with your hair. Dark hair? Light stole – white, grey, champagne brown, pink. Light hair? Dark stole. Mid-toned hair? I recommend going darker, very dark brown or black. Or pick a fur that has a contrasting element to your own hair. Shaped and tailored stoles look best with styles from the 1920s through to the late 1950s. They also work well for crinoline-wearing Victorian costumers. Our stylish friend Fandangle Fabulus shows us one way to wear a radical limbs-and-all fur stole. Guaranteed to attract attention. A lot of people are revulsed by vintage stoles that have the heads and feet still included. Others are fascinated. If you wear one, people WILL react! The entire-fox-fur stoles are compatible with today’s bohemian looks, if not with today’s bohemian morals. They’re also flexible for cosplay. How can I tell if my fur stole is real fur or fake fur? It’s so easy. Trim a tiny snip of the fur from a spot you won’t notice, and set it on fire! If it’s real fur, it will burn cleanly, with a little pale smoke and a distinctive burning-hair smell. You’ll be left with ashes and carbon. If it’s fake fur, it will melt and smoke and smell synthetic. You’ll be left with a black synthetic blob. Is the furrier who created my fur still in business? I get this a lot, and I don’t know why, since…people can Google this for themselves. 95% of the furriers of the past are now out of business, particularly in the United States. Many of them, back in the day, acquired furs wholesale and sewed in their own labels. They provided fur care, cleaning, and storage. If your stole has a vintage furrier’s label in it, Google the name, and if nothing significant comes up, your stole is still enhanced by the vintage label and provenance. How much is my vintage fur stole worth? Can I sell it? Model Sandra Mabey shows us a silver fox stole. The tipping on the silver fox contrasts with her blue-tipped hair. With furs, older doesn’t mean more valuable: condition, quality, and color have more meaning. Embroidered/monogrammed linings are a plus, as are labels from vintage furriers. Tears in the fur, tears in the lining, or fur that’s thinning/falling out all detract from the value. White or cream stoles are the most valuable. These are often sought for weddings. Here are some approximate sale values for vintage fur stoles in 2015. If you are selling your stole directly on eBay or Etsy, you will get close to these prices, once you find a buyer. If you are selling via a consignment store, you will get 50% to 60%, but your chances of achieving a sale are far better. People like to choose furs in person much of the time. White/cream/tourmaline mink or fox – $300 – $500 average, $800 – $1000 for something really good. White/cream rabbit – $1oo – $200. Maybe $300 if there’s a matching hat or cuffs. Brown mink, high quality – $300 – $500. Fox fur with head/feet – $150 – $350. Average stoles – medium quality brown mink, squirrel, nutria – $75 – $200. Unusual furs – skunk, dyed, shorn, chinchilla – varies based on fur type and quality. Skunk furs were popular, then “worthless”, and now they have novelty value again. Spotted cat, leopard, ocelot, seal, monkey – CANNOT be sold, see my article about furs from protected/endangered animals. Here’s an example of two different fur stoles. One is a high value stole. The other is of average quality and value. Compare them and come to your own conclusions…. A high-value vintage fur stole. Light color, tailored shaping, beautiful condition. This is also by a designer still in business today, Oleg Cassini. On sale on Etsy for about $900 US. 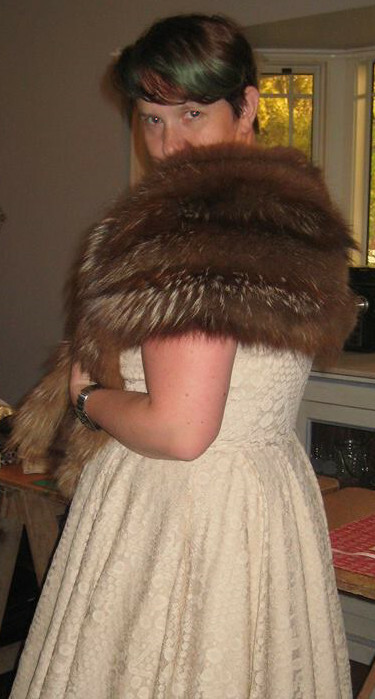 An average value fur stole from a standard furrier. Dark brown mink, less detailed shaping, still good quality, glossy fur. On sale on Etsy for $120 US. No designer label noted. Can I donate my vintage fur stole to a museum? Only if it has seriously interesting provenance. Because fur stoles were extremely popular from the 1930s through the late 1950s, museums with costume collections often have enough fur stoles. See my article about donating vintage clothing to museums for more information about this, and to learn how to donate successfully. There you have it, curious Internet denizens. Good luck with your vintage furs. Thank you for this article! I am really excited about buying my own fur stole. I’ve been looking on eBay- but as a non-petite person (I’m a 16/18 US), I’m concerned about fit/length. It would do no good to buy a stole that can’t wrap around me, or at the least meet in the middle! I’ve been googling on how to measure yourself for a stole, but nothing specific has come up- any advice? A little bit of advice. I should have mentioned that many vintage stoles are sized! Take your shoulder and bustline measurements and ask a stole’s seller if the stole is that width/length. Avoid vintage fox fur stoles – these often tend to run smaller across the shoulders. Buy one in person at a vintage emporium – you can even call ahead and ask about their selection. Or, go on Etsy and find one of the lovely faux fur stole creators and ask them to make something just for you. Thank you for the info! Im going to a formal ball wearing a mink stole with my gown. Can I wear the stole while indoors -ie is it considered a part of my outfit, or outerwear like a fur coat would be? Sorry about the delay, a fur stole can be worn indoors if you feel like it! It’s a transitional garment so it’s correct either way.